It’s completely open access, so have a look (and download the PDF, because it looks a lot nicer than the full text). It’s a fuller, better version of my MSc thesis, which means that I’ve been working on this project on and off since about April 2013. Testing was done in June/July 2013 and November 2013. Early versions of this paper have been presented at an ideophone workshop in Tokyo in December 2013, a synaesthesia conference in Hamburg in February 2014, and a neurobiology of language conference in Amsterdam in August 2014. It was rejected once from one journal in August 2014, and was submitted to this journal in October 2014. It feels great to have it finally published, but also kind of anticlimactic, given that I’m focusing on some different research now. I feel like the abstract and full article describe what’s going on quite well; this is a generally under-researched area within the (neuro)science of language as it is, so it’s written for the sizeable number of people who aren’t knowledgeable about ideophones in the first place. 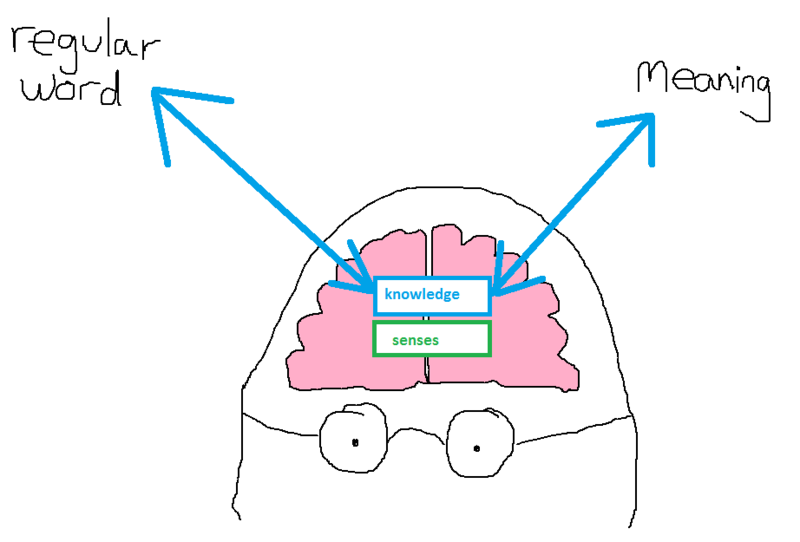 However, if you can’t explain your research using shoddy MS Paint figures, then you can’t explain it at all, so here goes. 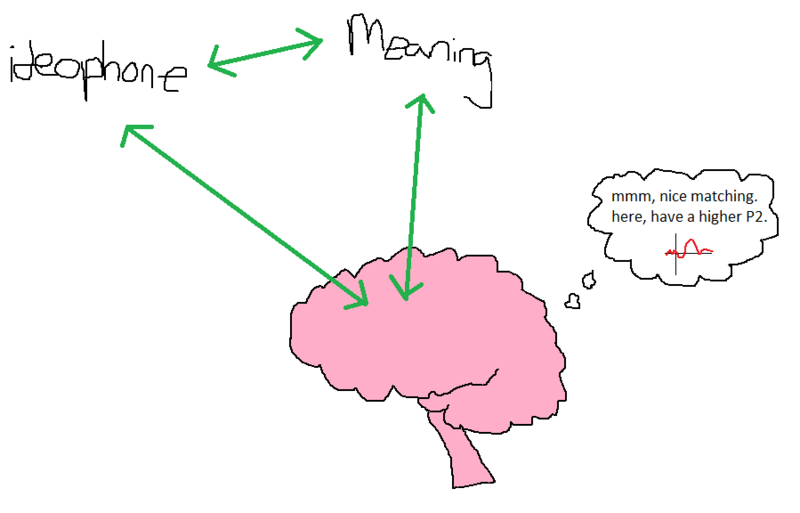 Ideophones are “marked words which depict sensory imagery” (Dingemanse, 2012). 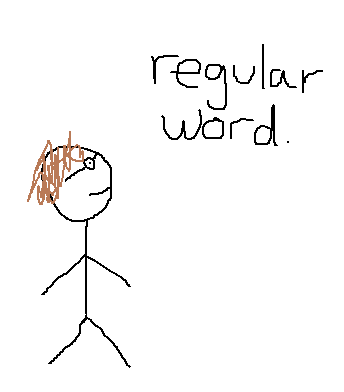 In essence, this means that ideophones stick out compared to regular words, ideophones are real words (not just off the cuff onomatopoeia), ideophones try and imitate the thing they mean rather than just describing it, and ideophones mean things to do with sensory experiences. This sounds like onomatopoeia, but it’s a lot more than that. Ideophones have been kind of sidelined within traditional approaches to language because of a strange fluke whereby the original languages of academia (i.e. European languages, and especially French, German, and English) are from one of the very few language families across the world which don’t have ideophones. Since ideophones aren’t really present in the languages of the people who wrote about languages most often, those writers kind of just ignored them. 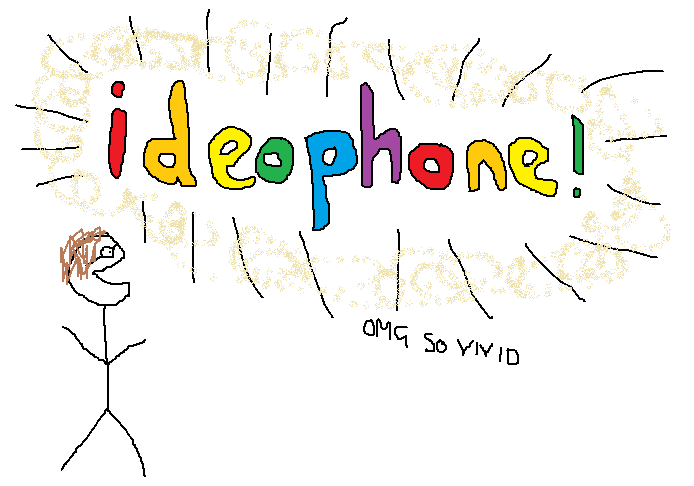 The less well-known linguistic literature on ideophones has been going on for decades, and variously describes ideophones as vivid, quasi-synaesthetic, expressive, and so on. These links between sound and meaning are known as cross-modal correspondences. Thing is, it’s one thing for various linguists and speakers of languages with ideophones to identify and describe what’s happening; it’s quite another to see if that has any psycho/neurolinguistic basis. This is where my research comes in. Hanako speaks French fluently (where “fluently” = perapera). Hanako speaks French fluently (where “fluently” = ryuuchou-ni). 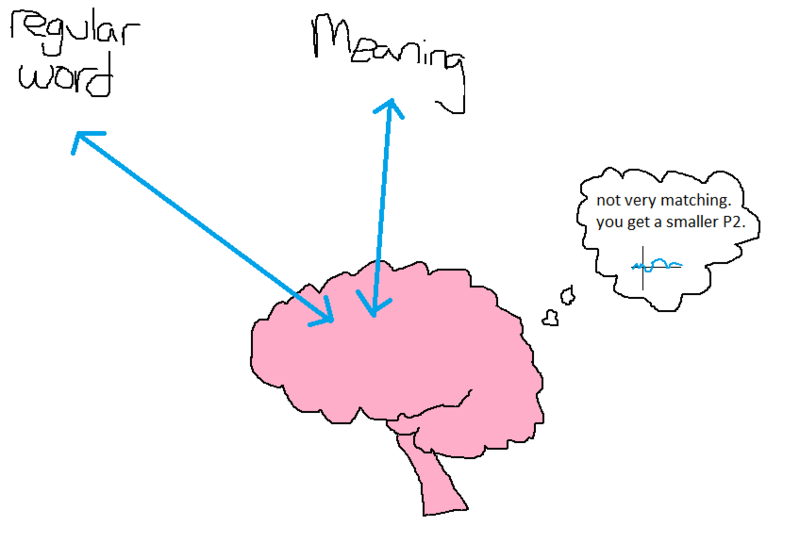 The red line shows the brain activity in response to the ideophones, and the blue line shows the brain activity in response to the arbitrary words. The red line is higher than the blue line at two important points; the peak at about 250ms after the word was presented (the P2 component), and the consistent bit for the last 400ms (the late positive complex). 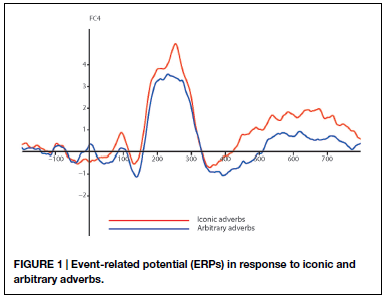 Various other research has found that a higher P2 component is elicited by cross-modally congruent stimuli… i.e. this particular brain response is bigger to two things that match nicely (such as a high pitched sound and a small object). Finding this in response to the Japanese ideophones suggests that the brain recognises that the sounds of the ideophones cross-modally match the meanings of the ideophones much more than the sounds of the arbitrary words match the meanings of the arbitrary words. This may be why ideophones are experienced more vividly than arbitrary words. As for the late positive complex, it’s hard to say. 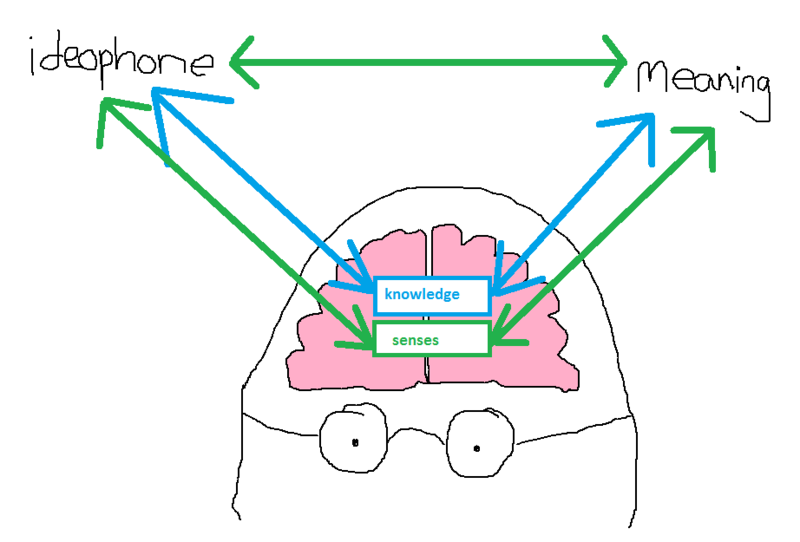 It could be that the cross-modal matching of sound and meaning in ideophones actually makes it harder for the brain to work out the ideophone’s role in a sentence because it has to do all the cross-modal sensory processing on top of all the grammatical stuff it’s doing in the first place. It’s very much up for discussion. → Using R to calculate better cricket statistics… or, how to revolutionise the way we slag off Ian Bell.